Marconi gelang 1899 die erste drahtlose Verbindung über den Ärmelkanal, 1901 der erste transatlantische Funkempfang eines Signals (Buchstabe S des Morsecodes) und 1903 die erste öffentliche transatlantische Kommunikation: Marconi tauschte von der Marconi Wireless Station in Cape Cod, Massachusetts, Grußbotschaften zwischen US-Präsident Roosevelt und dem König von England Eduard VII. aus. Das System wurde von der Kriegsmarine übernommen. Auch von der südwestirischen Mizen-Halbinsel kommunizierte Marconi mit dem vorbeifahrenden Schiffsverkehr auf dem Atlantik. 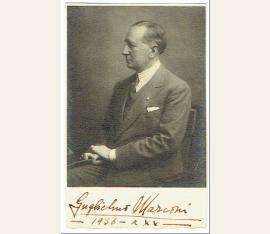 1909 erhielt Marconi gemeinsam mit Ferdinand Braun den Physiknobelpreis. italienischer Radiopionier und Unternehmensgründer (1874-1937). Albumblatt mit eigenh. Unterschrift. Rom. 8vo. 1 p. Mit Kuvert. Namenszug unterhalb seines Portraits. - Mit eigenh. Angabe seiner Geburtsdaten. - Im Jahr 1909 bekam er für seine praktischen Arbeiten im Bereich der Funktelegrafie gemeinsam mit Ferdinand Braun, der die theoretischen Grundlagen dazu erarbeitete, den Nobelpreis für Physik. Italian inventor, father of long distance radio transmission (1874-1937). 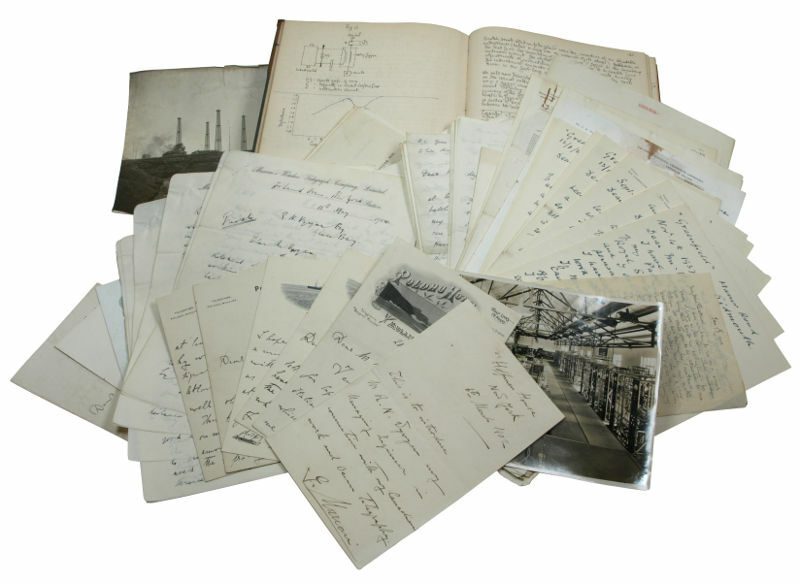 The papers of Richard Norman Vyvyan, Marconi's Chief Engineer, comprising over 30 letters by Guglielmo Marconi, letters by other correspondents including Sir Ambrose Fleming, and Vyvyan's journal recording their trial operations. Mostly London and New York, but including Mullion, Cornwall, Newport, R.I., etc. 8 ALS (6 March 1902-1 July 1905, 4to and 8vo, 41 pp.) 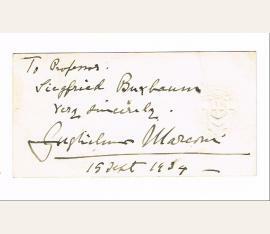 and 23 TLS (29 Aug. 1907-10 June 1909, 4to, 36 pp., plus one fragment of a letter signed) by Marconi. 1 ALS by Marconi's wife Beatrice (n. p. o. d., "Friday", 6 pp.). Also includes Vyvyan's illustrated. 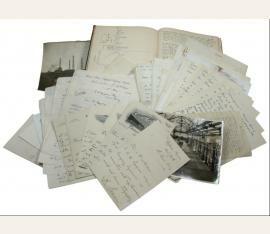 A major archive relating to the early years of transatlantic telegraphy. 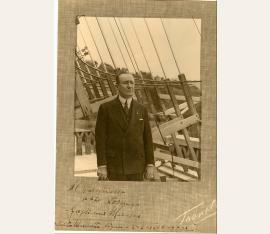 The engineer Richard N. Vyvyan was to a large measure responsible for both the construction and operation of the transmitting station at Poldhu in Cornwall, from where the first ever transatlantic signal was sent to Newfoundland on 12 December 1901, and in charge of the station at Cape Breton the following year when the first signal was sent the other way and a regular service established. His 1933 book "Wireless over 30 Years" remains an important source for the history of wireless. 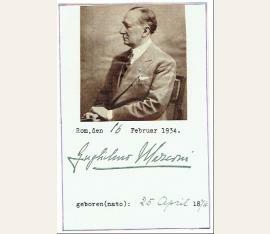 - Marconi's autograph letters, written at the time of the first transmission of telegraph signal from Canada to England, are almost all to Vyvyan, but one it to the engineer's wife, informing her that he has been "working very hard to try and find out what are the somewhat occult causes which make signals good one night and unobtainable the next, and also the reason of the great difference in distance over which signals can be sent by day compared to night. For this purpose I have had to carry out a very great number of tests between [Poldhu] and other stations on the east coast and in Scotland, and I believe I have found if not very clearly the cause of the effects noticed at least the means by which to obtain signals across the Atlantic by day as well as by night" (5 Aug. 1903). On 15 May 1904, in a "Private" letter of eight 4to pages, he provides Vyvyan with "a statement of the results obtained from the working of the Poldhu station during the last voyage of the S. S Campania, from Liverpool to New York [...] I have undertaken to carry out a series of tests to war ships stationed at different points, the receiving apparatus being taken in charge of by our assistants. I shall try various sending arrangements at Poldhu [...]". 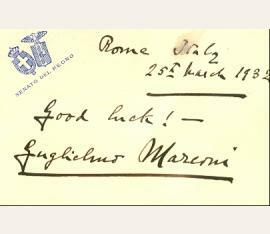 Other letters cover more domestic matters, such as Marconi's marriage ("It seems rather strange that I should have got married - doesn't it? but I am so glad that I have and we are very happy..."), their respective children (Marconi standing as godfather to the Vyvyan's daughter Mildred), and their life together in a shared house at Cape Breton. - Marconi's typed letters to Vyvyan constitute a more formal series, written in Marconi's capacity as Managing Director to Vyvyan at Glace Bay, discussing personnel and equipment: "Since my return here from London a few days ago I have been carrying out some interesting work. We are at present using only about half the available power of the plant, and the results of the programme, according to latest reports, are satisfactory in the light of the arrangements which we are using at this end. I hope that, by the time this letter reaches Glace Bay, you will have received the discs which were sent in charge of the operator of the 'Empress of Ireland' last Friday" (29 Aug. 1907). - Of especial interest are Vyvyan's illustrated autograph "Notes on Long Distance Wireless Telegraphy", beginning in 1900 with their work on the first transatlantic transmission ("In March of 1900 Mr Marconi after his invention of transmitting jigger decided that wireless telegraphy across the Atlantic was possible") and running on up to February 1904. A continuation volume is lacking. - The remaining correspondence archive comprises 9 letters by Sir Ambrose Fleming, co-worker with Vyvyan for Marconi and inventor of the thermionic valve ("I read of the death of Marconi in a four-days-old London Times newspaper when having tea at Vadheim in Norway [...] The obituaries which I have seen since return to England of him in the newspapers and magazines do not do justice to the cooperative work of his colleagues or of his contemporaries and I think it may be necessary to repair this omission [...] I agree with all you say about M. He had genius of a certain kind but he over-reached himself in thinking that he could appropriate the whole credit for wireless", 1901-1937), a letter by Vyvyan to his brother ("Baby has had the distinction of being the first who has ever had its birth announced by wireless telegraphy"), and a series to him by Godfrey C. Isaacs ("I would point out to you that this letter is marked 'Confidential' and therefore the handing of a copy of the letter to you must be treated as equally confidential") and by Alldin Moore ("how the dickens is [...] anyone at the Admiralty to deal with your Company except through you [...] you were & are the man one could say anything to without the fear of it being brought up in evidence later"). Several news clippings ("Television impossible [...] Official view of B.B.C.") and contemporary photographs of the transmitting station top off this fine collection that provides a vivid image of the nascent stages of a revolutionary invention..
Guglielmo Marconi (1874–1937), Physiker und Elektroingenieur. E. Albumblatt mit U. Rom, 25. März 1932. 1 S. Carte de Visite-Format. – „Good luck!“ – Auf Briefpapier mit gepr. Vignette „Senato del Regno“. Guglielmo Marconi (1874-1937), Italian physicist, inventor of Wireless Telegraphy. He was awarded the Nobel Prize in 1909. 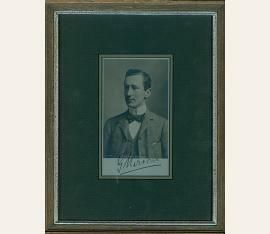 SP 3.5 x 5.75 inch, G. Marconi, n. p. n. d. The photograph shows Marconi in a head and shoulders pose, looking slightly away from the camera. Signed in black fountain pen ink. The photograph is under a passepartout and is framed. In fine condition. 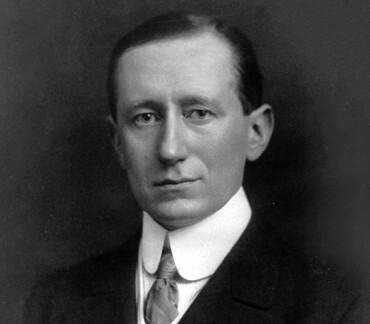 Guglielmo Marconi (1874–1937), physicist and Nobel laureate. 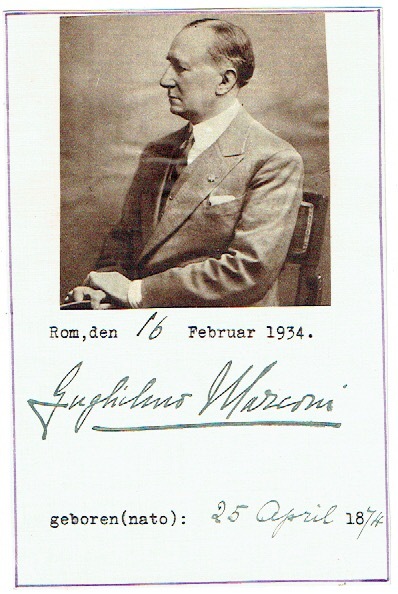 Portrait photograph with dedication signed, Santa Margherita Ligure, 2 September 1936, large 4to. Half-length portrait in semi-profile facing right. Signed and dated at lower edge. - From the studio of Bruner, Trento; right margin slightly cut off.